Police Sub Inspector Recruitment is going to conduct the prelims examination which is also called initial screening test. It means AP Police Department is going to filter the candidates in 3 tier manner. That is Prelims Exam, Physical Tests and Mains Examination. Main reason behind this is most of candidates are not having the sufficient knowledge to work. Those who qualified prelims examination they are only eligible for Physical tests and who clears the physical test they are called for the mains examination. Final merit list will be prepared based on merit in Mains examination and Physical tests. Prelims test marks not considered for merit list in AP Police SI Recruitment 2018. Sub Inspector Vacancies. There are more than 300 posts in this APSLPRB Recruitment 2018. Here we are providing the exam papers and Answer Keys for AP Police Sub Inspector recruitment. Paper 1 is almost same pattern which is given in 2016 SI Prelims Exam. Those who followed previous paper, they can clear paper 1 easily. But Paper 2 seems to be too difficult, while comparing with the previous exam. Here we are attaching the Paper 1 Arithmetic & Reasoning and Paper 2 General Studies. Key will be updated soon. Cut off marks for SC/ST candidates is 30. There are total 707 vacancies available in Andhra Pradesh Police Department Recruitment. SI Recruitment Application process will be online only and written tests will be conducted in 16 various centers. Good news is no 5 km running and 1.6 km running is conducted instead of that and it will be in Tracks only. On road running is no more. RFID Technology is used to calculate the timing of running by each candidate using RFID Tags. 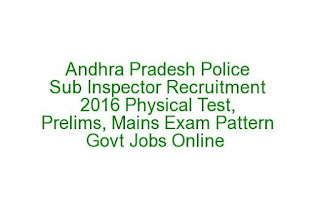 For more information regarding Andhra Pradesh Police Sub Inspector Recruitment Selection Process, Prelims, Mains and Physical Test details see below details. à5 Difficult one in SI recruitment is 5 Km running most of the candidates are being removed in this 5 km running. Even some times the candidate may have more educational knowledge but unable to perform in running and AP Police department missing truly the knowledgeable persons. So they now decided to kick out the 5 km running and instead of that 1600 meters running is introduced. So this time applications are going to increase in upcoming recruitment of AP Police Sub Inspector Jobs. So now it is more difficult to get a SI job in AP Police. If you have good knowledge you will be the winner. àThis time while comparing with the previous one female candidates are going to appear in different departments of Police Sub Inspector vacancies. In Civil Sub Inspector posts 33.3% and in Armed Reserve Category 20% of posts are reserved for women strictly. If women candidates are not available then those posts will be filled by male candidates. Selection for Andhra Pradesh Police Sub Inspector Recruitment will be held in three stages. For Sub Inspector posts prelims examination will be conducted for 200 marks and consists of two papers. Exam will be conducted in OMR or based or online objective type multiple choice questions. Qualifying marks for OC candidates is 40%, BC - 35% and for SC/ST - 30%. Those who are qualified in prelims examination they are only eligible for the Physical Endurance Tests. In previous recruitments 800 meters running, 5km, 100 meters running, Long Jump, High Jump and Shotput are conducted. From the upcoming AP police SI recruitment there is no 5km, 800 meters running, Shotput and High Jump..
Running will be conducted in Tracks of Play Grounds only. On road running is removed. And one more important one candidates running time will be calculated through RFID Technology tag system for each candidate. RFID system automatically counts the candidates running time. Mains examination will be conducted for 600 marks and consists of 4 papers. In mains examination 4 papers will be conducted. Topics for this AP SI Recruitment Mains examination will be announced soon. From upcoming recruitment of AP Police SI Jobs applications will be received through online only. And also hall tickets/ admit card, examination key details also will be available in online only. At the time of applying online must provide regularly using mobile number and maild id. 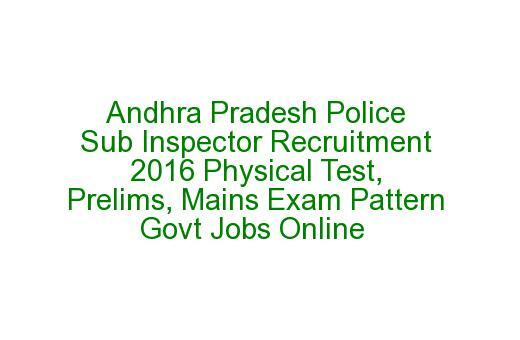 Because AP Police Recruitment Board will communicate with you through mobile or mail id only.